to instantly see that palm is rectangular and fingers are short. All the fl/pl and pb/pl and fl/pb calculations are uneccessary. given that standard fire palm (in CS system) is 8cm wide and 10cm long, Mooky's 8.5 x 11.5 is a longer rectangle. But (Mooky's hand) 8.5 x 11.5 does not in any way resemble a square. So it could not apply to any earth hands! I agree with you tho that CS system does not specify measurements regarding "how square is square", and I agree that even square palms are not usually exactly square. Martijn (admin) wrote: These are excellent questions Lynn! 1) is based on 4 examples of each hand shape from the books? when actually we are even questioning whether some of those examples are 'pure' handshapes? I think you need a bigger database of pure handshapes to base it on. 2) again I am wondering about this 'average' that we talked about before. I still haven't got my head around this, whether we are talking about the same thing when we talk about 'average' - are you talking 'average' or are you talking 'medium' - I don't think it is the same thing. If most people in UK have fire shape hands, that is not the same as saying that 'fire shape' is 'average'. "Average" handshape for Uk in general would not be the same as "average" for India in general. "Average" in a study of academics (air) hands would not be the same as "average" in a study of rural farmers (earth) hands and in a study of general (UK) population there would be more fire hands than all the other elements. (sorry I am still trying to understand this 'average' in the centre of your chart). 3) I also suspect that "AFTER adding more examples, I would probably be able to make the model even more accurate." You might be correct that "I have reasons to expect that the numbers in the 'hand shape profile' picture would hardly change at all." But I would like to see more examples of 'pure hands' than the 16 that you based it on. Martijn (admin) wrote: By the way Lynn, your words and arguments are getting more and more confusing for me. and I wasn't saying that "according the C.S. guidelines a 'combination hand shape' is indicated when finger length and palm width are the same?" I hope I have already answered these points in my previous posts tonight. ie fl/pb does not need to be taken into account for 'pure'handshapes, because it is implied already eg square palm + short fingers = earth. so, if the palm is square and the fingers are shorter than the palm length, then the fingers would obviously be shorter than palm width. The fl/pb calculation is not neccessary. It is only in combination handshapes where this calculation becomes useful to discern which combination of elements it is. (see Christopher's guidelines). No - water palm shape is narrower than Patti's rectangle. Martijn, it's late here now and I have spoken enough tonight! Please would you post your measurements and assessments of the 4 hands from Johnny's book. Then I will post mine. If they are very different from yours, I will re-measure them, and post you both sets of measurements/assessments tomorrow. Sorry for the confusion: I had only Johnny's 'air hand' photo example in mind (where I wrote 'fire hand') being the most problematic example. So, we do agree about that aspect. I will correct that in my post. Here are the measurements I took (on a car journey, hope they are accurate!). Martijn, before we assess the handshapes, can you confirm if our measurements and % agree? Thanks Lynn, your measurements look fine to me. - The EARTH HAND PHOTO has the finger-coordinaties: FL/PB 0.82 & FL/PL 0.69. This would implicate that if this example had been included in my model the average of the 5 earth hands would have shifted towards the center axis of the green zone, which confirms my expectation. - The FIRE HAND PHOTO has the finger-coordinates: FL/PB 0.88 & FL/PL 0.69. This would implicate that if this example had been included in my model the average value of the 5 fire hands would have been shifted towards the central axis of the red zone, which confirms my expectation as well. - The WATER HAND PHOTO has the finger-coordinates: FL/PB 1.12 & FL/PL 0.76. This would implicate that if this example had been included in my model the average value of the 5 fire hands would have been shifted away from the central axis of the blue zone - however the average would continue to be close to the central axis of the blue zone, which sort of fits within my expectation as well. So, I think these 3 photo examples together bring supportive validation that the model works fine. While Johnny's water example does not meet the key-charateristic of a water hand (which requires to have fl/pl close to 0.87 - while your measurements says 0.76), the finger length is clearly longer than palm width... and therefore finger length should not be described as 'short'. While, despite that Johnny presented it as a 'water hand' example, applying the formal C.S. rules to that example could even result in a 'fire hand' classification - though I should add here that your pb/pl ratio indicates that the palm shape is probably too narrow for classifying this hand as a (female) fire hand shape. Lynn, I hope my analysis of your measurements make sense (you can find the 'finger-coordinates' via the horizontal- and vertical axes in the picture below). Lynn, thank you for your other responses. - Nice to see you confirming that Patti's hand can probably best be described as a 'mix' of fire and earth (which I read as confirmation for my 'earth(+ fire)' assessment, since in the C.S. approach does not discriminate 'fire/earth' from 'earth/fire', etc)! - Nice to see you confirming that in the C.S. approach the 'grey area' is sort of the result of the absence of clear border between 'square palm' and 'rectangle palm'! "Air Hand: Large square palm, Earth finger 85% length of the palm and shorter than the width of the palm"
"In the Fire-Air hand, we have a Fire shape palm with the Earth finger as long as or longer than the width of the palm (hence the Earth finger is longer)." "Water-Air: 'Wide oblong' or 'narrow square' palm shape, Earth finger 85% length of palm but the same length as the width of the palm." Lynn, I observe that this is a clear clue that in the C.S. approach 'palm width' always matters...! However, one can add that in most hand shape variants (most pure hand shapes & most 'mixed' combinations) the 'palm width' does not become a key-feature. Lynn wrote: With regard to the 'pure' handshapes, the middle finger vs palm width criteria that Christopher posts here would happen 'by default'. I never used them because it happens automatically. ie it is obvious that in an earth hand with square palm and finger 75% length of palm, that the finger would also be shorter than the width. etc etc. Lynn, your comment does makes sense for me. But I think your comment should be understood in the perspective of the observation above. Because I think it is interesting here to observe how the 'palm width'-aspect in Christopher's definition for the Air Hand... is sort of a crucial element to understand all hand shapes properly (as defined in the C.S. approach)! Unfortunately... this specific guideline is missing in all books (Dukes, Fincham, Hirsch & Gettings)!!! Lynn, I would love to hear your thought regarding this observation. PS. For me it would be very interesting to hear from Christopher what he thinks of the fact that in all books his 'palm width' aspect for the Air Hand is not mentioned at all! Anyway, please do thank him for allowing you to share here a copy of his materials. I think that it's possible the width isn't mentioned because in most squares the width is equal to the length. Perhaps what you are asking is how big or how true a square the palm must be to be an air palm. And this true square would also relate to which side (length or width) is a bit too long or too short to be square. The descriptions above of an air hand having shorter fingers than palm width fits the description I have always used to describe my palms as air - squarish palms too small and fingers too long to be earth, so must be air. Personally, I think that if my palm is considered rectangle and fire, then the concept of a square palm is clearly not clear. If I compare this to my astrological chart the places where it strongly compares is that I am evenly spread with earth/air/fire with little water (Western system). Water is the one thing my hands clearly are not and using one method or another they contain a little of each of the other three elements. Perhaps this system better identifies pure types and mixed types showing a least dominant element. The clue and important factor may really be what is missing rather than what is so obviously there. Yes Patti, I think your problem directly relates to the missing of a clear definition in the C.S. approach for discriminating a 'squarish palm' from a 'rectangle palm'. Your hands do not meet the first requirement, because your fl/pl is even smaller than 80%. So your hands for sure do not meet Christopher's description for the Air Hand (your hands only meet the 2nd requirement). So, your palms are only 'Air-ish' regarding the first requirement. And your fingers are short in the perspective of both aspects of the palm.... so, I could argue here that regarding the 'Air Hand' your hands actually only meet 1 of the 3 requirements. CONCLUSION: Both of your hands should strictly not be associated with air hand shape at all (confirmed by your 'hand shape profile'). This evening I have found a clear example which illustrates that Christopher's guidelines leave this question unanswered as well. Earth finger 75% length of the palm and shorter than the width of the palm"
However, if we take a look at the pb/pl ratios in both examples... than we can see that both are not only far from 'squarish' (because a true 'square' would implicate that both aspects would be about equal)... there is even a considerable high difference visible in these proportions. Because in the first 'square palm' example the pb/pl ratio is 76%, while in the second example the pb/pl ratio if 86%. So, this implicates that according Christopher's guidelines even a pb/pl ratio of 76% could end up to be rated as a 'squarish palm'... while from a rational point of view it is quite strange to describe such proportions as 'squarish', of course! So, while I am very happy with Christopher's guidelines for finger length to palm width in all air-variants... for me it is also clear that his guidelines do leave some 'grey zones' (Lynn's words). And therefore in the C.S. approach there is no clear way out at all... one can only 'stop thinking' and simply accept the (inconsistent) definitions! So Patti, I think we are confronted here with a fundamental problem in the C.S. guidelines... which probably explains why during the past 2 decades various advanced students (Lynn, Johnny & Jennifer) felt the need to re-define the C.S. criteria & guidelines, etc. There is no way out in the system itself, but I do think that my 'hand shape profile' model does provide quite a few clues to specify each of the 4 hand shapes in terms of fl/pb, fl/pl and pb/pl...!!!!! So, I can only hope that others will recognize that there is for sure a way out...! Martijn, as I'm not used to working with the % of your charts, but more usually working with actual hand measurements, I have translated the figures as proportional to a 10 cm length palm as that way I can more easily assess it via CS methods. I haven't included the air hand as we agree the photo is not taken at a reliable angle. fingers short in relation to palm length. The palm is not much wider than standard (8cm) fire shape, but is slightly squarer. so I would say this is earth/fire handshape. But in the picture it looks like earth shape! I am not going to argue with yours & Johnny's assessment of earth. Standard fire palm 8x10, so this is close enough to be a fire palm, fingers less than 75% length of palm = fire hand. Yes the palm is a narrow rectangle, too narrow to be fire palm. But the fingers are not long, they are not even medium! (in relation to palm length), so I would say this is a fire/water hand. (because of the narrow palm). So although we are going about this from a different approach, we agree on the final assessment of handshape. If we wanted to use an air hand example, I wondered if we could use Johnny's own hands. But actually, they are not held up at a completely frontal angle either. In general, I understand your arguments. By the way, just wondering ( ) ... do you always 'calculate' the proportions? More important: very nice to see that there is not much difference between our assessments! "Fire-Earth: Squarer oblong palm, Earth finger 75% length of the palm and shorter than the width of the palm." ... then it's quite hard to say which of these 3 definitions is most accurate for describing Johnny's earth example (because Christopher's guidelines do not describe any specific criteria for discriminatiing these 'palm shape' variations by means of the proportions!). Lynn, though I fully understand your argument for that example (83% is indeed above the 80% of a typical fire hand shape, and thus it is more squarisch than the fire palm + probably not high enough to be classified as 'pure earth'), I am wondering... how much higher would you want to see the percentage rise... in order to classify it as an 'earth hand shape'? Anyway, I do understand your argument/choice for describing it as an 'earth/fire hand shape' - though it's a bit confusing that you also prefered to add that it 'looks' like earth shape. But it is also obvious for me that your words indicate that you don't want to start an argument about the details... because I think we are sort of confronted here with an aspect of the 'grey zones' in the C.S. approach. Anyway, thanks again Lynn for sharing your thoughts! PS. Regarding Johnny's hands, I agree with your observation that his hands are obviously not presented 'frontal' in both photos... and therefore it would not make sense for me to make any measurements (because due to the position of the camera the palm not only looks shorter... his fingers might also look slightly longer than their true dimensions - especially in the 2nd photo where the fingers are sort of pointing a bit towards a positions above the camera; maybe the photographer is a bit smaller than Johnny?). Martijn (admin) wrote: just wondering ( ) ... do you always 'calculate' the proportions? No I don't always calculate the proportions. Of course I am normally faced with a hand that is of normal size, not one that is 4mm long! I only translated it to 10 cm palm to give me an idea of the 'real' measurement proportions and what it looks like! Yes I understand that the definitions are a bit vague and could cover combination handshapes as well as pure ones. The clue is in the palm shape, but maybe it takes a trained eye (which I agree could have some subjectivity) to differentiate 'square' from 'obling' from 'narrow oblong'. Regarding 'it looks like' - I meant appearance from the book, at first glance appears to be square palm & short fingers, tho I would prefer to see the hand aligned with the wrist. If you pin me down to %.... would like pb/pl 85% minimum for square hand. I'd prefer 90% to be sure. well, as Christopher said, it's more of a general guide rather than a precise measurement. And as I said, it is a spectrum from earth-fire-water-air, so it kinda blends in rather than having specific demarcations! Yes Ok as soon as I posted the pics, I thought that maybe they are not frontal enough. Perhaps I should just ask Johnny to measure his hands! But actually even the angle that people hold their hands up gives some clue about elemental bias. Fingertips held towards the camera - prominencing the air element. I am very happy with your initiative to share Christopher's guidelines. Because these became very helpful for me to recognize that the rather simple descriptions 'square palm versus rectangle palm' and 'short finger versus longer fingers' are not accurate at all in order to assess hand shapes in the elemental perspective. And I perceive that this is also confirmed by Dukes' various guidelines in his book - words and pictures; though his guidelines became a bit confusing regarding especially his use of the word 'square' (and Christopher appears to have adopted this choice of words). 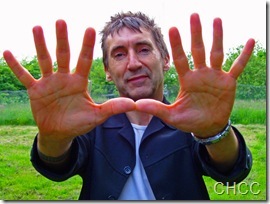 However, Christopher's guidelines regarding the finger length versus palm breadth clearly confirm that by principle this ratio should always be used in the perspective of elemental hand shape assessment... because that is only a logical consequence of the fact that it is a crucial element in the air hand shape. How can we proceed this discussion? Not sure that it would help us much if you asked Johnny to measure his hands. As an alternative I could invite you to share some 'pure' hand examples for each of the 4 elemental hand types from your collection, then I could use them to study the effects of your in my model in order to re-callibrate my model for the purpose to check/adjust the numbers that are now featured in my 'hand shape profile picture'. And then we can also see if my model would become more useful for you with numbers that are founded on your examples. Though, I think I have already shown that the major benefit of my model should be perceived in the opportunity to make an assessment based on rather simple measurements... with results that so far appear to be for a large part in line with your own assessments! I now also understand how my model can be translated into rather simple guidelines that are not far away from the C.S. approach, based on the similarities in the various 'hand shape code' variants that are listed for each hand shape. Martijn wrote: PS. For me it would be very interesting to hear from Christopher what he thinks of the fact that in all books his 'palm width' aspect for the Air Hand is not mentioned at all! Anyway, please do thank him for allowing you to share here a copy of his materials. as you are becoming aware,there is a lot of material in my written works which you won't find anywhere else :-). 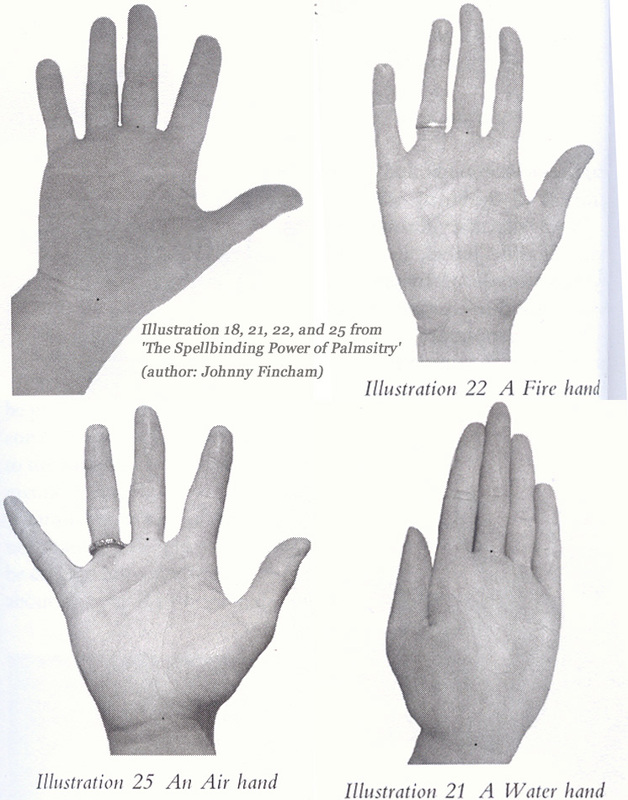 The extract the Lynn posted was written around 1992 as a definitive exposition on handshape and skin textures as a summary of my experiential knowledge as a handreader; clearly, there were more than just four handshape types. The first person to elaborate on the four handshapes developed by Gettings was Dylan Warraen-Davis, who was my primary tutor in handreading as was secretary of the CS at that time. Fire handshapes are by far the most frequently found in western cultures but when you look at them, you notice that they are not all the same shape - some are thinner, some are longer etc. Dylan was the first to suggest 'sub-types' of the fire handshape, namely the fire-water handshape and the fire-air handshape, though he never formalised it as I did later, just 'some look narrower' therefore more watery and some look wider' so therefore more airy...... Together with the fire-earth sub-type, I ended up with a seven fold handshape classification. From experience, I then created the formulas that I developed to determine whether one hand was Fire-water or Fire-air by using the length of the middle finger in relation to the width of the palm. I concede that this was only an approximate measurement and perhaps not quite sufficient for your standards, but it was a useful guideline when confronted with a myriad of hands. As far as I know, I was the first person to come up with this notion of comparing the length of the middle finger with the width of the palm - when you are teaching people you need to find some way of conveying to them what you mean! So, it was more of a practical aid to help people learn how to differentiate successive fire handshapes than a mathematical tool. Of course, these observations came to the fore in my work on Vocational Analysis from the hand as handshpes are a key part of that analysis. Nice to see you posting in this topic! Thank you for sharing your memories about how things developed in time. 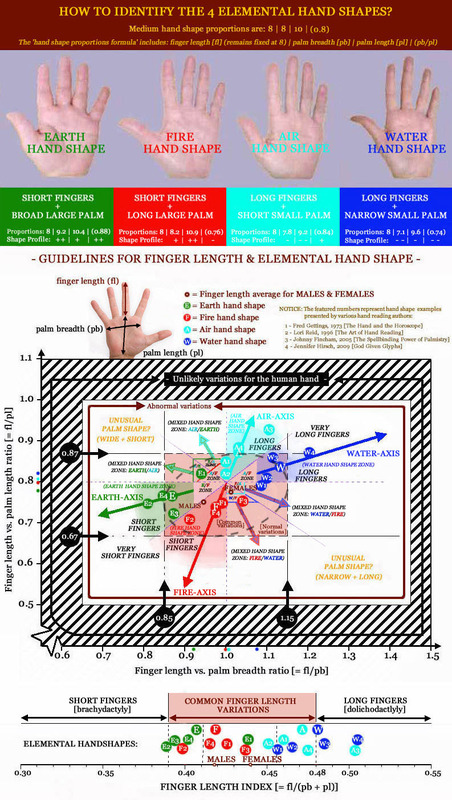 Earth aspect 4) IF finger length < 75% of palm length, then finger length requires to be < 92% palm breadth (otherwise it's a 'fire (+earth) hand shape'). Fire aspect 3) palm breadth < 80% of palm length. Air aspect 3) palm breadth > 80% of palm length. Water aspect 4) IF finger length > 85.5% of palm length, then finger length requires to be > 108% palm breadth (otherwise it's an 'air (+water) hand shape'). And the hands that do not meet all criteria for one hand shape will end up in one of the 'mixed' hand shapes categories. These rather simple principles leave no 'grey zones' at all. Dylan was the first to suggest 'sub-types' of the fire handshape, namely the fire-water handshape and the fire-air handshape, though he never formalised it as I did later, just 'some look narrower' therefore more watery and some look wider' so therefore more airy...... Together with the fire-earth sub-type, I ended up with a seven fold handshape classification. Interesting to hear you talking about sub-types. And interesting to hear that you had ideas about sub-dividing the 3 major sub-types that you identified... by looking at the width of the palm. In my study I found 10 sub-types that each have their own typical proportions. Water aspect 4) IF finger length > 75% 85.5% of palm length, then finger length requires to be < 92% > 108% palm breadth (otherwise it's an 'air (+water) hand shape'). I haven't checked all the details yet but at first glance it is looking good! I think you are right that this isn't far from CS approach. It is great that after all this discussion we have come to some agreement. I hope my input has been useful for you, as well as Christopher's. Good that you have put some more solid guidelines about "how square is square" etc to fill in the CS "grey areas", and also made your model much simpler as we progressed thru this. I would expect more like </= 75% for pure water shape. (but then of course that would affect aspect 1 - which would then have to be more than 100%). also Water aspect 4) IF finger length > 75% of palm length, then finger length requires to be < 92% palm breadth (otherwise it's an 'air (+water) hand shape'). should this be IF finger length > 75% of palm length but <80% ? Do you have a definition for fire/water handshape? re "Simples!" It makes me laugh every time you say it! Very nice to see you talking about 'some agreement'! And yes, your input has been of great value in this proces... of course! Regarding your comment about 'pure water shape'... the 'hand shape profile' shows that the code '- - | - | - -' can be recognized as the most pure water hand shape, which is featured iwith the requirement palm breadth < 75% of palm length. And finger length requires to be > 108% of palm breadth. So I think you are kind of struggling with 'how to read' the chart, because your ideas is actually confirmed by the chart!!! Well Lynn... I would first need to point out that this would require me to give you at least 2 definitions, because I could describe a definition for 'water (+ fire) hand shape' and a definition for 'fire (+water) hand shape'. I assume that this makes sense so far? How does this sound to you so far? I have updated my article with a re-vision regarding how to describe hand shape more efficiently; e.g. some part of the system of have been reversed (in terms of the '+' and '-' signs) - I also made this decision to take a away some inconsistencies that had been incorporated in my earlier presentations. The picture above describes the re-vision: e.g. the picture now shows more clearly how the finger proportions + the hand shape proportion relate to each other. And it is interesting to see how only in the FIRE hand shape and AIR hand shape the 'palm shape' tends to show characteristics that sort of 'contradict' compared the two finger length ratios. In order to avoid confusion about this re-vision, I have decided to LOCK this topic, in order to make a fresh start for this matter (see the topic: Find your elemental hand shape in 3 steps!) - because this topic has kind of proved that finger length is a topic that can only be studied properly in terms of 'proportions' to the palm shape.